Student Blogs For Reflective Writing | Gary G. Abud, Jr. This year, we are trying something new in my physics and chemistry classes: no homework. Instead of conventional practice-based homework, we are flipping the classroom…kinda. While there are no video clips to watch outside of class, we still want students to do their practice in the guided environment of the classroom, where they can collaborate to problem solve and make thinking visible. This also achieves a far greater depth and focus on the practice problems (applications of what we have learned) than would occur at home alone for students. In keeping with the teaching and learning process of ‘learning science by doing science,’ we need to have follow-up tasks that better match something a scientist might do after a day in the lab. It’s likely that scientists are going to reflect on what they accomplished after they finish their day’s work. I know I did when I worked in medical research. To take the place of what would traditionally be homework, students will be engaging in reflection on their learning outside of class. This will be accomplished through reflective writing. The ‘putting-it-all-together’ synthesis kind of reflection that follows up a day of data collection and analysis in the lab is what I hope to get students to accomplish with this initiative. However, since we are a BYOD classroom that uses technology to support teaching and learning, we will accomplish the reflective writing in two ways: short, focused, daily prompts answered via Twitter or email (the #Tweet180Project) and reflective learning blogs. 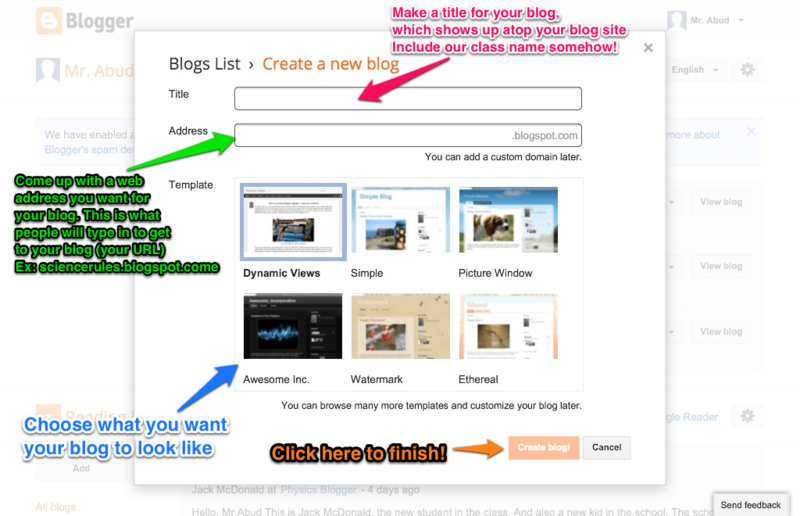 This is also helping our classroom to get students blogging in 2013. Students can make a Blogger blog using their Google Apps For Education account. I put some step-by-step instructions for getting started with blogs on my legacy website, but as a class we set up the blogs together in the computer lab. The goal of this writing initiative is to have students create a new reflective blog post each week. The blog entries will be reflections on what they learned during the previous week. They can be completed from the Blogger app on a mobile device or from the web on a computer. Students can even jot down some notes in the Blogger app in a draft post, or attach a photo from class, each day to help them build their weekly post content throughout the week. The blogs are not just a set of essay questions to be answered, but in fact they are meant to be an original reflection, like a journal entry, of what was meaningful to the student during the week. Blog posts can also later serve as a study resource for students or a digital portfolio of learning throughout the year. A very student-friendly tutorial on reflective writing from a university in Australia can help students focus their blog posts each week. I decided to model my class reflective blog posts after this as well. Making the guidelines clear, yet sufficiently open-ended, was very important, and articulating a very understandable rubric for scoring the posts has become an important development for this project. What were the main ideas we learned this past week? How do the main ideas go together or connect? What were some of the important details to the main ideas? What activities or experiments did we do that went along with these ideas? How did we come to know and understand the ideas we learned this week? What questions do I still have about what I learned this week? How was my participation in the learning process this week? How would I rate my understanding of all the ideas from class this week? What do I still need to work on more? 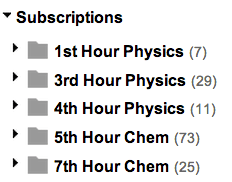 Using Google Reader, I create a folder for each class and organize the students’ blog feeds by class. From the web, I can easily view students’ posts by class or individual. Using an RSS feed reader with Google Reader synchronization, such as Flipboard or Feedly, I can browse, read, and review students’ blog entries by class with a very nice interface from my mobile device. Using an IFTTT recipe I created, which triggers when a Google Reader item is favorited, I can archive each blog entry in a Google Spreadsheet to know which ones have been graded. Now that Google Is Killing Google Reader, this workflow is going to require some modification to make it function smoothly for the future, but until July it is still reliable! Have you come up with an alternative to tracking yet? I am thinking of just having a Google spreadsheet organized by class with links to their blogs. Yes! That’s exactly what I’ve moved to doing. While you can still use an RSS feed reader, like Feedly, having them fill out a form and insert the URL to their post works great. Create a field for name, class, period, title, date and URL. Then, it all gets populated into a spreadsheet. You can see my form here: http://j.mp/blogscoringguide Alternatively, if you’re feeling ambitious, you might be able to create a trigger to do this automatically for them using IFTTT and have the Google Spreadsheet update live as they post. Do you comment on their blogs? Or, through what medium do you provide feedback? Also, you had mentioned in one of our workshop meets that the kids eventually self assess their blogs. Do you eventually use these assessments? The teacher comments on student blogs and students comment on their group members’ blog posts. The rubric scores are used to inform their writing revisions as time goes on, but only count as a grade for their reflective writing standard. Eventually, they (rubric scores) are not counted in the gradebook at all. The goal is pure reflection for metacognition. Reflective writing is part of lifelong learning that we are hoping to teach in the process.